Jim Scott was born in Deadwood, South Dakota. He was an alumnus of Nebraska Wesleyan University. Scott finished 14th in voting for the 1913 American League Most Valuable Player. He led the league in games started (38) and finished with a 20–20 win-loss record, 25 complete games, four shutouts and a 1.90 earned run average (ERA). 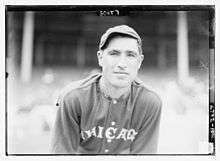 He led the league in shutouts in 1915 and helped the White Sox win the 1917 World Series. In nine seasons, Scott pitched 317 games (226 starts) and earned a 107-114 win-loss record with 123 complete games. He ranks 17th all-time in career ERA (2.30), 96th in career WHIP (1.18) and 54th in hits allowed per nine innings (7.73). In 1918 Scott served in the military during World War I. He also held technical roles in the film industry for many years, beginning with movie work in the baseball offseasons. Scott was an umpire for several years after his playing days. He umpired in the Southern Association in 1928 and 1929, in the NL in 1930 and 1931, and in the Southern Association again the following year. After the 1932 season, Scott quit umpiring and pursued full-time work on motion picture sets until 1953. He died in Jacumba, California at the age of 68. ↑ Bennett, John. "SABR BioProject: Jim Scott". Society for American Baseball Research. Retrieved May 8, 2013.